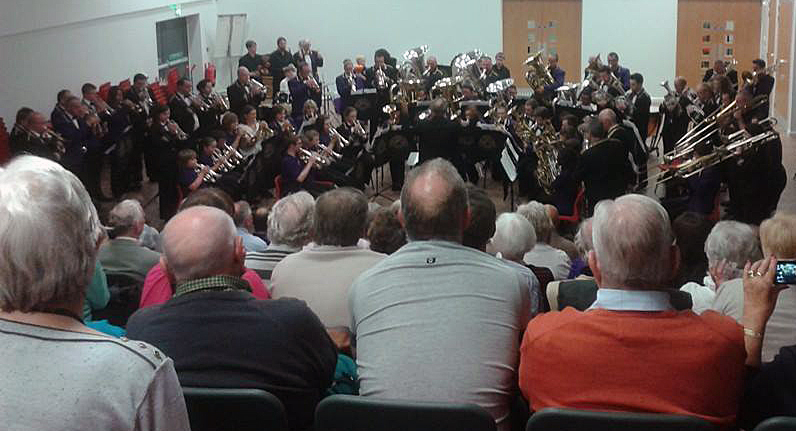 On Saturday 19th October the Skelmanthorpe Brass Band Community put on their annual 3 bands concert at Shelley College. The concert is regarded by many as the highlight of the year as the Training Band, B Band and Senior Band all share the stage and perform their respective programmes to an appreciative audience. Under the direction of Robert Jagger the Training Band once again showed that they are progressing nicely and that the future of the community is in capable hands. They performed a programme that included William Tell and the theme from ‘Dances with Wolves’. Next up was the B Band, fresh from their success at the National Finals and sporting their newly acquired runners up trophy. Phil Garlick chose a programme that began with a rousing rendition of the television theme ‘Stringray’ and went on to feature excellent solos from Oliver Booth on Baritone and Oliver Rath on Trombone. The B Band closed their programme with Phil’s own enjoyable medley incorporating a number of well known songs by the artist ‘Adele’. Following the interval the Senior Band took to the stage under the direction of Les Beevers. Les has a long association with the band and spoke of his high regard for the community, stating that Skelmanthorpe is the only band he would come out of retirement for! The band began with Saint-Saen’s ‘French Military March’, and later featured a Horn solo entitled ‘Evergreen’ performed by Laura Brown. Laura was then joined by the other members of the Horn section, Paul Musgreave and Paul Oldfield and the three performed Goff Richard’s ‘Trio con brio’, a piece the audience certainly enjoyed. The spot finished with a stunning version of soprano player Mike Kilmartin’s ‘The King of Love my Shepherd is’ followed by ‘MacArthur Park’ before Mr Beevers left the stage to ‘Marching Onwards’. All members of the Training, B Band and Senior Band then performed as a massed band, finishing the evening with a bright, fun rendition of ‘Greased Lightning’. As always a great night was had by the audience as well as band members and the community would like to thank all involved. The future’s bright, the future’s purple!